meeyauw: To love at all is to be vulnerable . . . 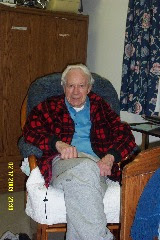 This is my smiling father in 2003 at Union House Nursing Home in Glover, VT.
Daddy was an enigma: a withdrawn and emotionally distant intellectual, mathematician, physicist, and engineer. His childhood scarred him so badly that he was unable to maintain contact with his own children and we have all suffered greatly. Yet he is still my hero and probably always will be. Named after my father, I never felt I was able to be the person he wanted me to be. In the end, ironically, when he was trapped in his body and brain with Lewy Body Dementia, I felt that I met his expectations. I cared not what trapped him: I finally was able to spend time with him. I spent every evening with him. We watched the news or Antiques Roadshow. We talked and I read books to him. I would leave when it was time for him to go to bed. On Sundays I spent many afternoons with him eating in the dining room. They were wonderful times for me. I finally felt useful and important to him. Best of all, Daddy never was confused about who I was. The nursing home was my social life and my church was my support. The books we read were important to us. We covered the ancient history of the British Isles, the history of ∏, a history of e, and finally, a history of trigonometry. We read at least two of Eli Maor's books. In each book that we read I carefully wrote the date of when we finished them. Christmas 2003 was the most beautiful of my life. Two of my children, Amelia and Andrew, were able to be with me for Christmas. The Christmas Eve service was held at the Glover church. The church is next door to Union House. I asked permission to take my father to Christmas Eve service, the nurses dressed him appropriately for the walk in the cold, clear night and off the four of us went. The short walk was ice. It was dangerous for him to be out walking on it. But with me on one side, my tall and strong Andrew on the other and Amelia in the back, we kept him safe and secure. He was able to walk up the steps. The sanctuary was already packed and many of the congregation knew as soon as they saw us that this was my family that they had never seen. I was so proud and so happy that we were together. Daddy sat between me and his grandchildren. I was concerned that he might become confused and anxious with the crowd of people and with the music. But he never was scared. He recognized every hymn and sang every one. I cried with happiness during the whole service. I had given my father a Christmas in which he participated and which touched his heart. At the end of the service, the flame of the Christ candle is passed from person to person throughout the whole congregation. As we light our neighbor's candles in the darkened sanctuary we sing Silent Night, Holy Night until every single candle is lit. Daddy accepted his flame from Amelia and he then passed it on to me. He held his candle steady, despite his Parkinson's shaking. After the service we made our way through the throng. The congregation was wonderful as they parted for us so that we could pass through them without Daddy being crushed. They helped us down the stairs and past the ice in front of the church. They understood the importance of this night for this small broken family. I have never experienced such a holy Christmas. When Daddy died in 2004 my life unraveled in many different and strange ways. He is no longer here to help me as I struggle to put it back together. I can tell how close you and your dad were...it was the same as me and mom. She passed away last September, I'm still having a hard time coping with it. I'm so glad for you that you were able to get close to your father. What a beautiful Christmas that must have been for you.